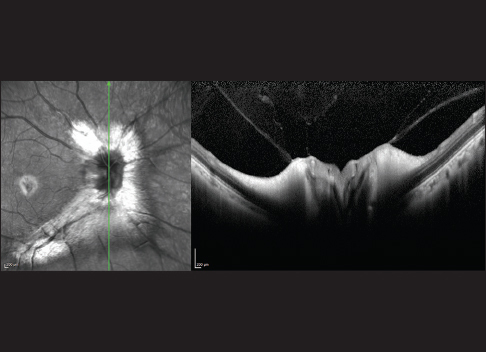 We aim to report an unusual case of myelinated retinal nerve fibers (MRNFs) at fovea. A 39-year-old woman presented with visual impairment and her visual acuity was 20/80 in the right eye. Ophthalmologic examination revealed MRNF lesions at inferior and superior poles of optic disc in the right eye. Furthermore, a ring-shaped MRNF lesion with feathery edges was observed at fovea. MRNF lesions are rarely seen at macula, and to our knowledge, this is the first report of an MRNF lesion at fovea. Myelinated retinal nerve fibers (MRNFs) are usually asymptomatic and unilateral benign lesions of the retina. 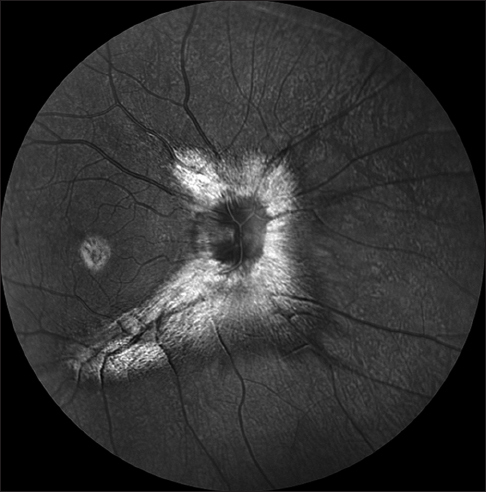 The prevalence of MRNF was reported as 0.57%–1% at population-based studies., Usually, MRNF lesions present as yellow-gray patches with smooth or feathery edges and obscure the underlying retinal details and vasculature., Shape and distribution of the lesions corresponds to retinal nerve fiber layer (RNFL). Although MRNF lesions are generally located adjacent to optic disc, they may be located on wherever RNFL exist in the retina. 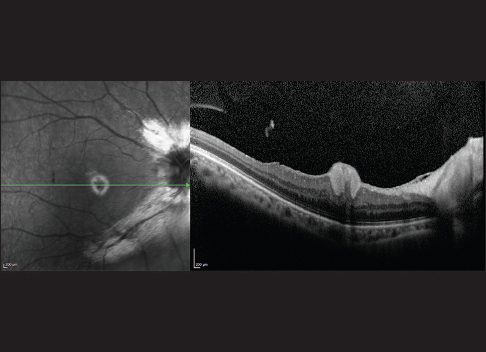 In the literature, many MRNF cases have been reported including macular involvement and unusual clinical associations., In this report, we present an unusual and rare case presented with MRNF lesion at fovea. A 39-year-old woman presented with vision loss in her right eye. The best-corrected visual acuity was 20/80 in the right and 20/20 in the left eye. Ophthalmologic examination revealed MRNFs at inferior and superior poles of optic disc which were spreading parallel to the vascular arcades. In addition, a ring-shaped MRNF lesion with feathery edges was observed at fovea. Infrared images showed MRNF lesions and their borders clearly [Figure 1]. Vertical cross-section image of optic coherence tomography showed thickened RNFL and hyperreflectivity with backscattering [Figure 2]. Thickened RNFL at fovea and foveal depression filled with the mass of MRNFs were also observed [Figure 3]. Normal myelination process of human optic nerve system starts from lateral geniculate nucleus and progresses to the optic nerve., Myelination of optic nerve stops at the lamina cribrosa (LC).,, Anatomic organization and structure of LC and mediators secreted by type 1 astrocytes are supposed to be the inhibitor factors of oligodendrocyte penetration trough LC. With these properties, LC is believed to be an anatomic and protective barrier to prevent retinal nerve fibers (RNFs) from myelination. The underlying mechanism of myelination of RNFs is still unclear. In MRNF cases, LC is proposed to be defective and let oligodendrocytes to pass to the retina causing myelination. Hence, any reason which harms the anatomic function and unity of LC may promote pathologic myelination of RNF. This mechanism could be an explanation of myelination of RNF adjacent to the optic disc. In addition, acquired MRNF causes such as radial optic neurotomy, optic nerve fenestration, and gliomas may trigger myelination of RNFs by causing LC defects. In our case, myelination of RNFs are isolated at fovea and there is no MRNF lesion between the optic disc and the fovea. To the best of our knowledge, spared and isolated MRNF lesions which, connect to optic disc with a normal structured RNF segment, are supposed to have a different underlying mechanism of myelination and oligodendrocyte migration. Usually, MNRF lesions do not cause visual acuity loss, but it may present with relative scotomas corresponding to the location of MRNF lesions., Widespread MRNF lesions with vision acuity loss may present with axial myopia, amblyopia, and strabismus., In addition, MRNF at macula may be another reason of visual impairment. Widespread MNLF has been reported at macula without foveal involvement. In our case, ring-shaped MRNF lesion mass that filled the foveal depression could prevent light transmission or distort the normal anatomic structure causing visual impairment in the affected eye. Theoretically, myelination could not proceed to the center of fovea due to the absence of RNFL. To the best of our knowledge, the ring-shaped lesion at fovea could be a differential finding of MRNF among foveal lesions. Cases with regression of MRNF associated with inflammatory diseases and glaucoma were also reported in the literature., The regression of widespread MRNF lesions leaving a spared lesion at fovea may mimic our case's presentation. However, MRNF lesions in our case were stable and no other ocular pathology, which may cause regression was observed during follow-up. MRNF may present with the ring-shaped lesion at fovea and should be considered in the differential diagnosis of foveal diseases, which cause visual impairment. To our knowledge, this is the first report of foveal MRNF. Straatsma BR, Foos RY, Heckenlively JR, Taylor GN. Myelinated retinal nerve fibers. Am J Ophthalmol 1981;91:25-38. Kodama T, Hayasaka S, Setogawa T. Myelinated retinal nerve fibers: Prevalence, location and effect on visual acuity. Ophthalmologica 1990;200:77-83. Kreidl KO, Lin DY, Egbert JE. Myelination of the macula associated with disabling photophobia. Arch Ophthalmol 2003;121:1204-5. FitzGibbon T, Nestorovski Z. Morphological consequences of myelination in the human retina. Exp Eye Res 1997;65:809-19. Tarabishy AB, Alexandrou TJ, Traboulsi EI. Syndrome of myelinated retinal nerve fibers, myopia, and amblyopia: A review. Surv Ophthalmol 2007;52:588-96. Prakalapakorn SG, Buckley EG. Acquired bilateral myelinated retinal nerve fibers after unilateral optic nerve sheath fenestration in a child with idiopathic intracranial hypertension. J Pediatr Ophthalmol Strabismus 2012;16:534-8. Sowka JW, Nadeau MJ. Regression of myelinated retinal nerve fibers in a glaucomatous eye. Optom Vis Sci 2013;90:e218-20. Chavis PS, Tabbara KF. Demyelination of retinal myelinated nerve fibers in Behcet's disease. Doc Ophthalmol 1998;95:157-64.